The outpouring of emotion around the sporting world in the wake of Phillip Hughes's death continued with the Australian cricketer's funeral on Wednesday. Throughout the past week, the message from all those connected with the sport has been clear: this was a tragic accident, a freak incident. No-one is to blame. 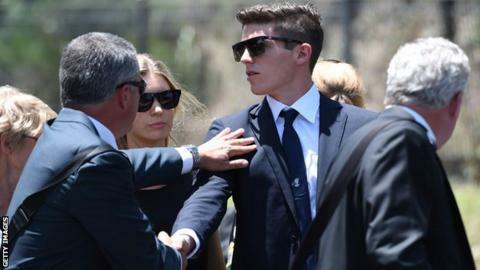 The support for Sean Abbott, the bowler who delivered the fatal ball, has been much in evidence, from former and current cricketers to wider public campaigns on social media. One poignant intervention came from South African bowler Mbulelo Budaza, who is back playing first-class cricket 13 months after one of his deliveries caused the death of compatriot Darryn Randall. The trauma of inflicting serious or fatal damage on a sporting opponent can last for years. The healing process takes time, as the boxer Brian Rose knows only too well. His biggest fight was overcoming the demons that haunted him after a brutal bout in 2009, which left his opponent Jason Rushton in a coma and caused lasting damage to his health. "I know exactly what Sean Abbott is going through," says Rose. "It is a devastating thing to know that you have thrown the punch or bowled the ball that has left someone seriously injured or killed. It's the worst feeling in the world; it's just a nightmare." Rose recalls how he was affected by the incident, the impact on his boxing and temperament, and how a psychologist helped him rebuild his career. Birmingham-born Rose was 25, a promising young light-middleweight rising through the ranks, when he faced Rushton for a British regional belt at the Bolton Arena in October 2009. It was Rose's first title fight. Although he won comfortably thanks to a late stoppage, the brief joy of victory was soon replaced by longstanding despair. "I remember in the 10th round I hit him with a shot which wasn't much and he went down. When he got up I took it to him and tried to stop the fight. At the time, out of all the shots I hit him with I didn't think that one would put him over. "He lost every round. He never looked like he was in the fight and, to me, they looked like they could have stopped it sooner. The towel should have gone in. So we got the decision. I knew I'd won the fight. It was the best moment of my career at the time - my first ever title. "On the way back to the changing room he collapsed right in front of me. He actually died - but the neurologist we had at ringside brought him back to life. "I only found that out a couple of months afterwards when the doctor told me. It was bad enough just seeing him collapse." Rushton spent the next couple of days in a drug-induced coma. Rose, with long-time trainer Bobby Rimmer, went to see the 26-year-old in hospital. "That was a big mistake - but it had been playing on my mind so much. "He still had the bruises from the night before and half his head was shaved and caved in where they'd been operating. "It was the most horrific thing I'd ever seen; I just shouldn't have gone. It will stick in my mind forever. "There are some things I've learned to forget about - but that is something I will never get out of my head." The lasting mental scars threatened to derail Rose's career. He became timid and fearful of what might happen to him in the ring, and of what he was capable of doing to others. In boxing parlance, he became 'gun shy'. His next fight, seven months later, was against a journeyman called Max Maxwell, but Rose was not the same fighter. "I learned more in those two fights than most fighters would in their careers because I seriously hurt someone and then got knocked out myself. "I didn't just get knocked out and stopped, I got knocked unconscious - but I shouldn't have been in there and I knew that. "I was gun shy. That's something that usually happens to older boxers who have been in a few wars. They develop a fear of getting hit. I was also pulling off my punches massively and I was sitting on the ropes letting him bully me. "But boxing is all I know and I was fighting for the money - that's another thing I'll never do again. I knew then that I would never get into a ring again unless I was right." In Rose's mind, he retired after the Maxwell fight. Demons, as he calls them, had taken over. The intervention of a psychologist, Emma James, helped Rose come to terms with the damaging after-effects. "I couldn't have gone back into the sport without psychological help. I couldn't have carried on. "She gradually made me realise that none of what happened was my fault and that it could have happened to me. She also made me realise that if I was hesitant then it could happen to me. "Before I got back in the ring, she came and watched loads of my training sessions to make sure I was punching properly and that I was confident in what I was doing and saying. "Sean Abbott [who is undergoing counselling] is sure to go through a similar process. He might even be scared of being hit by a ball himself. "He has a family and he'll know how upset Phillip Hughes's family is. They won't be blaming him - but he might think they are." The Rushton family "never once pointed the finger" at Rose. While he says that was a comfort, it did not help the healing process on a personal level. "It stressed me out and it caused all sorts of problems between me and my girlfriend Danielle. It caused problems with my mum and dad. "As soon as someone mentioned it I'd lose my temper; I'd just snap. I just didn't like talking about it. "I might have been stressed about something else, but people always assumed it was because of Jason Rushton. I was blaming myself for what had happened. "For a year afterwards I kept in touch with Jason's girlfriend who would send me weekly updates of his progress. But then their relationship got into trouble. She was telling me he was moving out and I was thinking, 'Oh my God, this is all my fault'. "I was told I had to stop the contact with the girlfriend, otherwise I wouldn't ever be able to carry on with my own career. I emailed her and explained I couldn't speak to her anymore. Things got easier after that. "For Sean Abbott it could be a long process but people deal with things differently. His situation is a bit different to mine. He might never get over it, or it might take a month - but with the right help there is every chance he will come back." Rushton is now blind in one eye and has severely limited vision in the other. According to the Sensory Team at Doncaster Council, he developed a range of subsequent health issues including schizophrenia and epilepsy. Rose still sees a psychologist. "If he'd died I don't know what I would have done. Sean Abbott is in a worse position than me. "Jason will never work or fight again but at least he has his life and his family around him. That's more precious than anything." On 3 December 2011, Rose won the British title he craved by beating Prince Arron and in March the following year, in his first defence, he avenged that harrowing defeat by Maxwell. "I wanted to put the record straight - but I also wanted to prove that I had overcome my demons," added Rose, who fought the highly rated American Demetrius Andrade for the WBO light-middleweight world title in New York last year. The 29-year-old was stopped in the seventh round by Andrade after twice being knocked down, but has not given up hope of becoming a world champion. He won his last fight and will be back in action on 23 January in Manchester, fighting for the WBC international light-middleweight title against Carson Jones. One thing is for sure: Rose won't be holding anything back. Read more on Phillip Hughes: Why does a death in sport hit us so hard?